physical activity to bowl…have you ever seen a typical league in Beaver County, PA? You put a baseball bat in my hand, and I could juice more than A-Rod, Barry Bonds, Roger Clemens, Sammy Sosa, and Mark McGuire combined, and I’d still hit the ball about 15 feet. In basketball, I used the short and white excuse to my advantage to cover up the fact I had very little game. Football? If only you saw the uncoordinated disaster I was in intramural football. I was the fat kid for a couple stints, and I was the anorexic kid for other stints of my K-12 days. Neither were appealing for a sports team. I usually was picked last in gym class for pretty much every sport. That is not exactly a great feeling. It makes you feel inadequate, worthless, and shoves a knife right through the slight bit of self esteem you have left. a quarterback does (a good one at least). There were some sports where I was still picked last in by people I could quadruple lap in the 2 mile. I’ve been told, “You can’t do this, you can’t do that” a million times before. 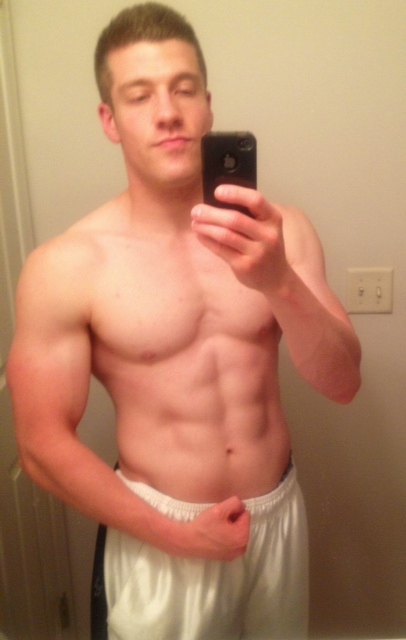 I’ve also been encouraged by a lot of people to pursue personal training because I am a motivator. Also, due to the fact that they have seen me progress from a toothpick to where I am now. I always made excuses as to why I shouldn’t pursue it. I’ve experienced plenty of disappointment. However, something told me to get up and change my life. Get in the gym and leave everything you got every single day. It wasn’t fun being overweight (except for eating tasty food). I know what it’s like to be really skinny with no muscle. I’ve gone through eating disorders. I’m very self conscious. I always wore shirts to the pool WHILE I was swimming. I was embarrassed. I’m an ordinary person…I’m definitely was not born a physical specimen by any means. I am an example that ANYONE in normal physical condition can reach their fitness goals. I remember the torture and humiliation (some from others, some self-inflicted) and I use those experiences as fuel everyday to continue to improve myself, so in turn I can improve somebody’ else’s life. Being fit not only helps you out in sports, but at your job, at everyday life; it takes the stress away. Think about it, were you in the same position as me? Look at me now. I guarantee I’m in better shape than almost every “team captain” who picked me by default because I was the only person left. If you’re feeling down…don’t GIVE UP and GIVE IN. Prove your naysayers wrong…prove yourself wrong.